This practice guide is specifically devoted to making or opposing termination motions such as summary judgment, dismissal, or motion to strike. 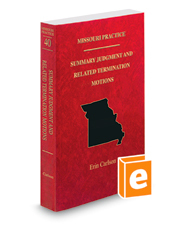 It provides ready-to-use citations for supporting and opposing motions, plus fully briefed sample motions for quickly creating pretrial motions. It also includes practice tips.